If you are looking to increase engagement or gain followers on Google Plus please feel free to reach out to me at jwojdylo@gmail.com. I offer several packages for businesses and individuals that will increase +1’s, reshares and comments to a personal profile or page. As you can see, this post received quite a bit of engagement in the form of +1’s, reshares and comments. In fact, I have had several Google Plus gif posts that have maxed out at the 500 comment mark. My goal is to have one post a day that goes viral which will receive over 3000 +1’s, 250 reshares and 300 comments. This is almost unheard of for most users on Google Plus but I have been testing for several years and I have come up with a way to reach a very broad audience. In fact, my posts that go viral are often seen by over one million users. You can see how many views a gif or image has by simply clicking on it. The view count will be displayed under the photo or gif. So, how do you share moving photos or animated gifs on Google Plus? Unlike other social networks there are a few steps that must be taken to make certain your gif actually plays in the stream. The first thing you should do is download the gif as a .gif file. There are a few places I find gifs but I will keep that a secret. You can search around on Google or Tumblr and find some good ones for yourself. 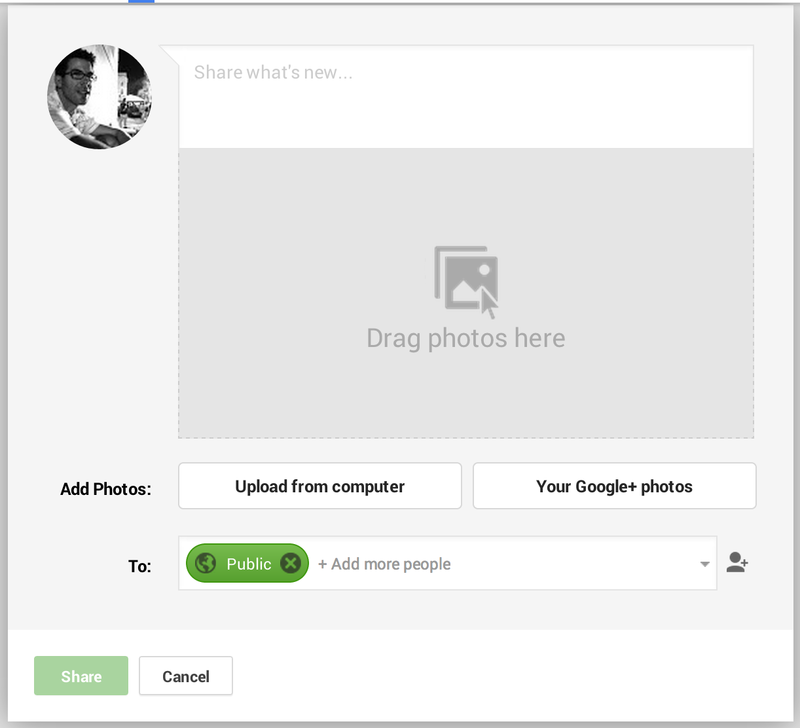 After you have downloaded the gif you will need to create a new Google Plus post. You can either drag the gif from the place in which you shared it or you can click the upload from computer tab. Select the .gif file you saved and you should see the gif moving before you even hit the green share button. Notice in the photo above that the green share button is light green. As soon as you upload your gif or any photo the green share button will become a darker green meaning you can now share to your stream. 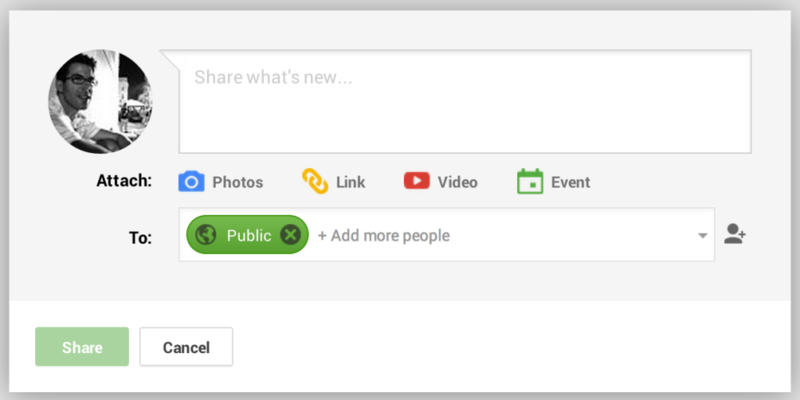 It is extremely important to understand that your Google Plus share is not going to go viral just because it is a gif. Something I do effectively is add a title and a sub context to all my gifs. I know my following so I also know what will make them laugh or smile. As you grow a Google Plus following you will be able to better understand what they like to see. If your goal is to increase exposure of your personal profile or your Google Plus local business page it takes some effort. As mentioned, I offer several packages that will help individuals when it comes to Google Plus. Do not hesitate to reach out to me at jwojdylo@gmail.com if you want to discuss how we can form a business relationship to help you get your business rolling on Google Plus. This will ultimately help in search, with SEO and will increase brand exposure on Google’s social network. How Different Generations Adapt to the Internet and Social Media | The Psychology of Instagram; Can It Be Used for Business? I always want to ask but didn’t. Thanks for writing this article with great examples. You have a gift for explaining what seems complicated, Jesse.